Up, up and away - oh what fun this was! My first experience in such a small plane flying over Vermont and getting a bird's eye view. The picture taking was not good until I asked permission to open the window (you have to be careful it doesn't slam against the wing), and got my lens out there. 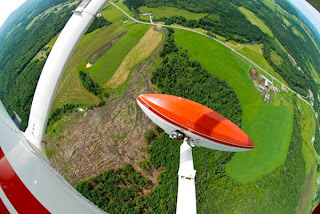 My arms were sore from holding on to the camera and lens, but it was worth it to learn about taking aerial photos.